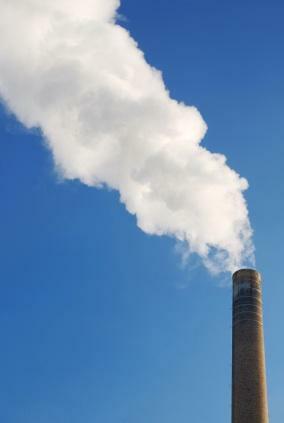 Air pollution can cause mercury poisoning. Mercury is a byproduct of the manufacturing process. It can also be released into the air in the form of a gas when coal is burnt. Once the mercury is released into the air, it can travel over long distances. Eventually, the mercury comes down to earth in the form of rain or snow. As a result, mercury contaminates lakes and streams. Small animals in the water are exposed to mercury, and when fish eat them, the fish become contaminated. The risk for humans from mercury poisoning comes from eating the contaminated fish. Humans can also be exposed to mercury by inhaling it. If you live or work near an industrial plant that burns coal (or any other fossil fuel), you may be at increased risk for mercury poisoning. Health consequences of being exposed to mercury can be serious, depending on how much of it the person has been exposed to, and for how long. Pregnant women, especially, should avoid coming into contact with mercury, since it can cause neurological problems in the developing fetus. Children who have been exposed to mercury before birth can have difficulty with their memory, paying attention, and language abilities. The person with mercury poisoning may complain of headaches, ringing in their ears, and dizziness. A persistent cough or shallow breathing may be symptoms of mercury poisoning. Cramps and diarrhea are also associated with mercury poisoning. The person may also complain of pain or pressure in the chest. Their heartbeat may become irregular and their pulse may be weak. Health care staff may notice blood pressure changes. A metallic taste in the mouth may be a sign of mercury poisoning, along with bleeding gums, bad breath, ulcers, and loose teeth. As you can see, all of these symptoms may be attributed to other conditions and disorders. In addition, the person may complain of muscle weakness, pain in the joints, cold hands and feet, and fatigue. Treatment for mercury poisoning will depend on whether the mercury was inhaled or ingested. If the mercury was airborne, the patient may be given humidified oxygen. A breathing tube may be inserted into the lungs, and medications may be given to get the mercury out of the body. If the patient consumed the mercury, the treatment is a little different. Hospital staff would likely start by giving the affected person IV fluids and drugs to treat their symptoms. Activated charcoal may be used to absorb any mercury present in the stomach. Chelators are used to treat mercury in the blood. Chelation therapy works like this: Some substances (chelates) have the ability to bind to heavy metals (like mercury, lead, iron, and copper) and remove them from the body. One chelate that is commonly used is called EDTA (ethylene diamine tetra-acetic acid). This amino acid has been approved by the Food and Drug Administration (FDA) for treatment of mercury poisoning. Any exposure to mercury should be treated seriously. In the United States, call the National Poison Control Center at 1-800-222-1222 for advice and information. The person should be taken to the closest Emergency Room as soon as possible for evaluation and treatment.